Raise your hand if you used any sort of interactive trip planner or transit app today. Many of us in the Baltimore Region rely on some form of technology to get us to and from the places we need to go each day, and sometimes, this can include taking transit. Many transit agencies in Baltimore (and throughout the US) have made their maps and schedules available online. However, when published in formats that tools like Google Maps and apps like Transit or NextBus can use, more people can access and utilize these interactive trip planning tools. While this is useful from a commuter’s perspective, it begs the question: what happens when there are no transit directions available? 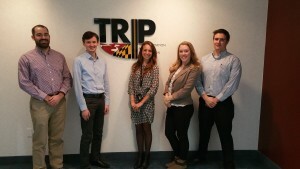 Central Maryland Regional Transit’s TRIP team worked to establish statewide GTFS for Maryland. This allows people throughout the state — from Cumberland to Ocean City — to plan their trips using transit. The team of young professionals created 18 systems’ worth of GTFS and enabled access for hundreds of thousands of commuters across the state. Developed by TriMet of Portland and Google, the General Transit Feed Specification (GTFS) exists today as a commonly used, standardized format of transit data. GTFS feeds allow transportation agencies from around the world the ability to publically display their transit data and schedules via Google Maps or other trip-planning services. The TRIP team decided to utilize the National Rural Transit Assistance Program’s (RTAP) GTFS Builder in order to generate transit feeds from around the State of Maryland because of its overall simplicity and no-cost arrangement. GTFS, and our GTFS efforts in Maryland, are critically important to a number of vulnerable populations. For transit-dependent riders with low-English proficiency, GTFS through Google Transit or through third-party applications is able to automatically translate the information provided in English to over one hundred other languages, allowing these individuals access to crucial transit information and access to jobs, healthcare, and more. Because GTFS can function in a way that makes transit information so much more accessible, it also can accommodate transit agencies’ Title VI requirements. The numbers don’t lie: because of the TRIP team’s work, 187 routes for 18 systems have been placed onto Google Transit and are fully accurate, up-to-date, and functional. This valuable effort serves transit-dependent populations throughout the state, and commuters will now have accurate information allowing them to make regional connections. Maryland, through the TRIP project, is the first state to create these feeds for transit agencies for no cost, using tools that most transit agencies already have access to. Click here to sign up for our mailing list (free) or Join the YPT Baltimore Chapter as a full member for only $20 per year! Learn more about us and how to join the steering committee! Join the YPT Baltimore Board! From PAYT Maryland to YPT Baltimore: Where are they now? Announcing the First Ever YPT Baltimore Strategic Plan! Another successful tour with a fellow YPT chapter!